One thing I’ve noticed over the past 11 years covering Tower Hamlets is how easy it is to find some kind of link in national political rows to the politics of east London. Today, the Mail on Sunday carries a story on comments made at a Palestine Solidarity Campaign hustings in Ealing in February 2015. It quotes Rupa Huq, then the parliamentary candidate for Ealing Central and now its MP, telling the audience that a Labour government “could probably” ensure Britain apologised for helping to create the state of Israel in 1948. The story says this is the latest episode in Labour’s anti-Semitism row. It’s not been a good couple of weeks for Rupa Huq. Ten days ago, she unwisely went on to the Today programme in an attempt to defend Naz Shah over her anti-Semitic Facebook postings. She told Radio 4: “If it is career destroying it seems we are entering a phase where its trial by Twitter. As far as I know Naz Shah did not write antisemitic tracts or anything, she pressed ‘Share’ on a picture which was idiotic and foolish. It’s not only the perils of social media. As Rupa is learning, it’s also the perils of speaking in public, on the hoof, on matters about which you’re not fully briefed, where anyone can record you, and particularly if those knowledge gaps include Palestine and Israel. I first met Rupa in 2007, when she was up against the likes of Lutfur Rahman, John Biggs and Rushanara Ali in Tower Hamlets trying to secure the Labour candidacy for Bethnal Green in Bow. She wrote a short diary piece (left) about her experiences for me at the East London Advertiser at the time – and asked it be headlined ‘Diary of a Nobody’. She struck me then as being slightly naive about the poisonous waters of Tower Hamlets politics and I was relieved for her when she failed to beat Rushanara. I’m not sure some of that general naivety has completely disappeared. As a direct result of the Mail article (which, at her insistence, this morning changed the words ‘should apologise’ in its headline to ‘could apologise’), she has received some pretty vile hate mail by email. I won’t name the person who emailed this, but let’s look at what prompted him to send it. She added: ‘But it sounds a bit Tony Blair to me though, and we all know what happened to him. Ms Huq – whose sister is the former Blue Peter presenter Konnie Huq – told The Mail on Sunday that the remarks she made did not reflect her actual views. ‘I don’t think that, those aren’t my views,’ she said. ‘I was answering a question. I went on later to say that there shouldn’t be an apology. Rupa told me today that with Angie Bray, the Tory candidate, declining to attend the February 2015 meeting, she was ‘probably the most right wing person there’ and was frequently jeered. She said she felt a little bit out of her depth on the specifics of questions raised. “On the question of the historic legacy… I mean I said at the beginning that it’s a long, long history – you can trace it back to BC. I mean I think you’re referring more specifically to 1948 that happened under a British government? To my mind… an apology… Yes you could do one…. a Labour government could probably get that through, but it sounds a bit Tony Blair to me though, and we all know what happened to him. He did apologies for the Irish potato famine in 1998 amongst other things but he was pilloried. I mean you couldn’t make it up. So a bit more nuanced. She is a strong supporter of the two-state solution and strongly supports Israel’s right to exist. No doubt she’ll get vile emails from the other side now. However, for the wellbeing of her own political career, she’d be well advised to stick to subjects on which she is a master of detail from now on…and stay away from the media for a while. This article originally appeared yesterday on Open Democracy under the headline ‘The neo-colonial plot to halt Bengalis in Tower Hamlets’. I’m reproducing it here via its Creative Commons Licence. It is written by Ansar Ahmed Ullah, described on Open Democracy as “a community activist who has lived and worked in the East End of London since the 1980s. He has worked as a youth, social and community worker and has been an active anti-racist campaigner. He is currently involved with the Nirmul Committee, a campaign group set up to challenge the rise of religious fundamentalism.” As a disclaimer, he is also my brother-in-law. Following and prior to the recent 12 June Tower Hamlets mayoral election results, it seems some on the liberal and white left are asserting that racism and Islamophobia were at play. But such well-wishers are in fact colluding, appeasing, empowering and encouraging the most right wing, reactionary and corrupt fundamentalist elements of the Bengali/Muslim community in Tower Hamlets. It seems that there is a group of white leftists, trade unionists & Christian faith leaders who would prefer to keep the Bengali community insular, ghettoized and away from the mainstream. They ignore the history of the Bengalis who came to Tower Hamlets as economic migrants during 1950s and 1960s to better their lives and those of their children, and overlook the history of that community’s stand against ghettoization by the GLC in the 1970s. These self-appointed saviours talk as though the Bengali community is unable to resist racism. They forget how, following Bengali factory worker Altab Ali’s murder in 1978, it was the Bengali community that fought the racists off the streets of the East End physically almost on a daily basis, dealt with the unannounced arrivals of the National Front and Combat 18, and later the BNP – without the protection of 3,000 police. 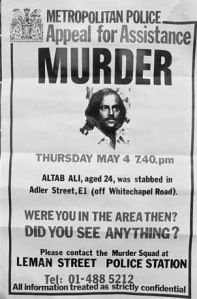 For the Brick Lane Bengali community, who were under constant attack from the racists as early as 1975 – 1976, the murder of Altab Ali in 1978 was a turning point, especially of its youth. It led to their mobilising and politicisation. They began to organise youth groups, community and campaigning groups, linked up with other anti-racist movements and groups. The year 1978 saw the emergence of second-generation Bengali community activists who entered mainstream politics in the 1980s to bring about meaningful changes to their lives. Defenders of Tower Hamlets First ignore the fact that the Bengali community elected Rushanara Ali to represent them at the House of Commons. They also ignore the large number of Labour councillors (including many Tower Hamlets First councillors who were once Labour councillors). Today Tower Hamlets Council can boast the largest number of elected Bengali councillors in any one borough with a total of 25 Bengali councillors. This didn’t happen overnight. The community had to struggle within a political process for a long 20/30 years to reach this stage. The Bengali community in the 1980s forged alliances between the first and second generation Bengalis. The second generation’s strength was consolidated in the formation of Federation Bangladeshi Youth Organisations (FBYO) in 1980, a national umbrella body that spearheaded campaigns for better housing, health and education and stood up against institutional racism. The Federation was the first truly national campaigning organisation that made a public representation of Bengali interests and spoke for Bengalis across the borough and nationally. At the same time Bengalis also built alliances with activists outside the Bengali community, such as other ‘Asians’ from Hackney, Newham, Camden, Southall & Bradford, and those from the white majority community of the East End. As a matter of fact Bengali political activism dates back to the beginning of the 20th century. Evidence of the early activism of Bengalis in London can be seen in the formation of organisations such as the Society for the Protection of Asian Sailors in 1857 and the Indian Seamen’s Welfare League in 1943. The Bangladesh Welfare Association was formed in the 1950s, the largest community organisation with a membership of over 40,000. It was activists of the Bangladesh Welfare Association who went on to establish the historic Brick Lane Mosque in 1976. The East London Mosque was built by a very different group of people with outside finance. As Bengali community activism grew, many activists took prominent roles in community politics. Brick Lane became the center of Bengali activism. Today Brick Lane has become merely a global icon, a branding concept as in ‘Banglatown’ and ‘the curry capital of Europe’. Supporters of deposed mayor Lufur Rahman and his allies talk about Islamophobia but intentionally or conveniently ignore Islamism, working with Islamists who include those responsible for war crimes and other violence in Bangladesh. Thus these white activists and men of peace are colluding with the most extreme reactionary elements, inspired by fascism and far-right ideology, rehabilitating them and giving them legitimacy. One such war criminal, who was recently found guilty by a Bangladesh War Crimes Tribunal, got a clean slate by a Christian activist with utter disregard for Bangladesh’s judiciary. He called him a man of integrity! A man found guilty of the killings of Bengali intellectuals by aiding the Pakistani military in setting up killing squads. Another Christian faith leader even posed the question ‘What is Islamism?'(!) Far from challenging or distancing themselves from the fundamentalists they are colluding in the name of ‘engaging with neighbours’, for a quick gain of access to large ethnic audiences. 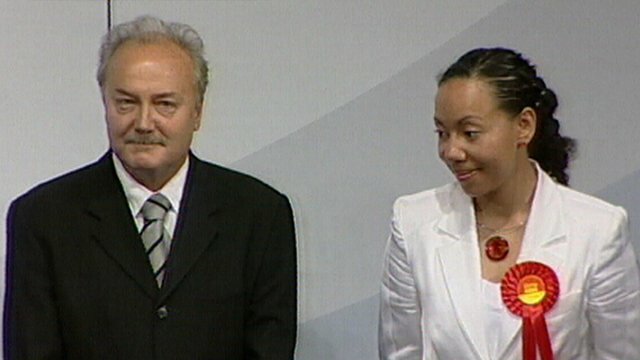 To highlight this point let’s revisit the general election that took place in 2005, when the local Islamists switched sides from the Labour Party and aligned themselves with George Galloway’s Respect Party which came out of the Stop the War coalition, a front organisation of the SWP. The SWP/Stop the War Coalition built up relationships with Islamists during the anti-Afghanistan/Iraq war demonstrations. Galloway used the religious sentiments of the local Bengali Muslim community in the East End of London for his own personal political gain. 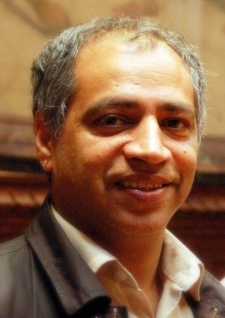 In his quest to challenge New Labour at the general election, he went into an un-holy alliance with the SWP and local fundamentalists, who went against their fellow Bengali Muslim candidates. The white liberal left leadership has refrained from condemning the Islamists. These whites are themselves showing a colonial mentality and playing a dangerous game of divide and rule by fostering divisions within the community by supporting one section against the other. The community can do without these self-appointed spokespersons for the Bengali community. The 81,000 Tower Hamlets Bengalis can and have looked after themselves without the patronising intervention of white advocates. Rushanara Ali’s would-be challenger gives a live TV interview. Oh dear. Cllr Rabina Khan, Lutfur Rahman’s cabinet member for housing, was the latest to draw the short straw for media appearances yesterday. Lutfur himself only agrees to Panorama interviews these days. His deputy, Oli Rahman, is considered, er, a little too bold for these occasions, so it was left to Rabina, who has previously worked for the BBC, to defend the council after the PwC report yesterday. She has ambitions to become the Tower Hamlets First MP for Bethnal Green and Bow. She gave the interview to BBC London News last night while standing in the foyer of the town hall in Mulberry Place. One person who witnessed it said she was being coached on what to say (during the interview itself) by the council’s head of communications, Takki Sulaiman. I’m told he was waving at her like a disoriented semaphore operator. “No evidence of fraud,” was what he apparently mouthed at her repeatedly. I think he may have put her off. Something did. It was a bit of a car crash. She should have been more natural. The interview is about seven minutes in here. Maybe those who followed your lead may regret they rushed to judgment about LBTH and our processes? Meanwhile we get on with the business of running services – and working with the auditors. I’ve been looking forward to publishing those words today. It’s always easy to jump to judgment with Tower Hamlets council. Some of the “damning report” headlines that appeared across the media this morning were quite probably pre-planned. I said in my last post I’d reserve judgment until I’d gone through some of the details and listened to the exchanges in the Commons. Well, the exchanges among Tory and Labour MPs were universally damning, there’s little doubt about that. My prize goes to Ealing MP Steve Pound, who can always be relied upon for vivid language. He said the mayor’s office was responsible for a “foul, fetid, reeking stench” emanating from wonderful Tower Hamlets. But what of the substance of the report itself? There was no knockout blow, but I have to say, the more you read the details, the more damning it is. The tone suggests the PwC auditors were shocked by what they found. The council and Mayor Lutfur Rahman are today trying to downplay its importance. They claim “no criminality or fraud” was found and that council processes had already picked up much of the PwC findings. To paraphrase Takki, maybe he and Lutfur may regret they rushed to judgment about the journalists investigating and reporting on Tower Hamlets. Lutfur, whose hopes of returning to Labour are now dead, may also regret the day he decided to “reform” the way grants were decided at the town hall. One of his early decisions as mayor was to abolish the Grants Panel, an open committee of councillors that published in full the background papers for their decisions, and replace it with a behind-the-scenes committee of mates and officers…with himself having the final say. I warned at the time this was a mistake and I included it in a lecture to delegates at the Centre for Investigative Journalism in 2012. It was also the area I advised the Panorama team to go hunting when we first met in the summer of last year. As it happens, the PwC report is a full vindication (not that one was needed) for the Panorama programme. We welcome the findings of the report. Panorama’s investigation uncovered serious concerns about the use of public money, and today’s report vindicates the strong journalism we have continued to defend amid inaccurate commentary and misinformation surrounding the programme. Before we get into the detail of some of the report, let’s get a few other statements out of the way. This is a shameful report that shows a disregard for proper, transparent, accountable decision-making by the current administration. If money has been allocated to preferred organisations or areas of the borough then it follows that others have missed out. The Mayor cannot dismiss this damning report by independent auditors as an attack by his political opponents as he always has done until now. He now has nowhere to hide and should think very carefully about whether his actions are compatible with remaining Mayor. “Labour demands the highest standards of probity in our elected representatives, and this damning report vindicates the decision to expel Lutfur Rahman from the Labour Party. Councillors in Tower Hamlets have been fighting unjust grants allocations and opaque, rotten decision making since Lutfur Rahman was thrown out of the Labour Party and stood as an “independent” Mayor. Earlier this year we sought to start a recruitment exercise for a Chief Executive – we do not currently have one. 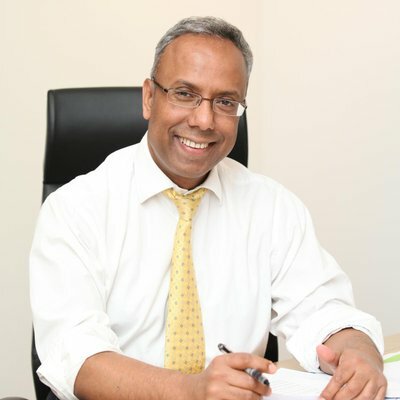 Lutfur Rahman has chosen not to co operate. Now PwC has called into question the adequacy of the council’s governance arrangements. It is a cause of sorrow and shame for this great borough that Luftur Rahman as Mayor has taken us to the point of government intervention. He should consider his position. Tower Hamlets deserves better. We need to be clear that there was no evidence of fraud or criminal activity identified in the PwC report published today. All governance issues identified in the PwC report have already been highlighted by our internal processes and are being rectified accordingly. Given that Tower Hamlets Council is one of the highest performing local authorities in London, and the wider UK for service delivery to our residents, I am surprised at the Secretary of State’s comments today in the House of Commons. I believe that there is a huge disparity between the detail of PwC’s report and the level of the Secretary of State’s comments. We will be responding to Mr Pickles in due course. This certainly sounds as if those clever lawyers at Tower Hamlets are urging some kind of legal challenge. I think they and their masters would be wiser to pipe down, take the medicine, and get on with the business of governance. And prove to the Commissioners who will soon arrive to oversee parts of the authority that they’re semi-competent. Eric Pickles was scathing in the House today, and he clearly enjoyed himself. Politicians like taking action, no matter how much they say they don’t. Based on the PwC findings he’s proposing to appoint three Commissioners to oversee the distribution of grants, the sales of properties and council publicity. The Commissioners will also oversee the recruitment of three senior positions on a permanent basis: a new chief executive, monitoring officer (bye-bye Meic Sullivan-Gould) and a new chief finance officer. None of these positions is currently filled on a permanent basis, and that, according to the PwC, has been part of the problem. In Tower Hamlets it’s easy to become immune to some of the goings-on. We’ve seen them time and again for far too long. But for newcomers, the situation is surely shocking. So it’s not good enough for the mayor’s supporters to downplay important process failures or to suggest similar discrepancies would be found in a £1m audit of any other local authority. Pickles plans to dispatch three commissioners to administrate grant-giving, property transactions and the administration of future elections in the borough. The commissioners, who will be answerable to Pickles, will be in place until March 2017 and are tasked with drawing up an action plan to improve governance in the council, including the permanent appointment of three senior council officers including a chief executive. Pickles said his direct intervention was against everything he believed in, but he said the report, conducted by the accountancy firm PwC, showed the directly elected mayor, Lutfur Rahman, had sown division and should bow his head in shame at the report’s findings. Executive power had been left unchecked and misused, he added. …Pickles said the report painted “a deeply concerning picture of obfuscation, denial, secrecy the breakdown of democratic scrutiny and a culture of cronyism risking the corrupt spending of public funds”. He proposed that all Tower Hamlets grant-making, property disposals and publicity functions be sanctioned by the commissioners. In an attempt to reduce the threat of electoral fraud in the 2015 general elections, Pickles also announced that the appointment of electoral registration officer and returning officer are to be exercised by the commissioners. He added that he wanted the council’s written agreement within 24 hours that they would not appoint an officer or make any grants pending the start of his intervention package. He said grants had been distributed without rationale, any clear objectives, monitoring, transparency and with officer recommendations systematically overruled. He pointed out that across mainstream grants by the council, 81% of officer recommendations were rejected, and more than £400,000 was handed out to bodies that failed the minimum criteria to be awarded anything at all. He added that Poplar town hall had been sold against official advice to an individual who had helped the mayor in his electoral bid. The report is almost 200 pages long and I’ll do a series of write-ups over the coming days. It is also likely to have cost more than £1m to produce. I had been expecting Eric to announce DCLG would pick up the tab, but he said the burden must fall on Tower Hamlets taxpayers. That’s surely unjust–and a mistake politically. It gives Lutfur’s team an attack line. The politics of martyrdom plays well in Tower Hamlets, after all. Would this report, had it been published before the election, persuaded many Lutfur voters to desert him? My instinct is not many, and I do wonder whether Rabina Khan might now be emboldened to go after Rushanara Ali in Bethnal Green and Bow in May. In fact, there are some Lutfurites pondering the possibility he himself may resign and call a Mayoral by-election to re-establish legitimacy. I doubt he would. As I said, more on the detail tomorrow. This blog post has been updated at the end of the original article with an email/legal threat sent to me this morning (Monday, Nov 4) by Takki Sulaiman, the head of communications at Tower Hamlets council. Further update (Friday, November 8): A sentence has been deleted from the original article (see marks in red below). This follows a letter sent to me yesterday from the council’s chief executive’s directorate in the name of Interim Monitoring Officer Mark Norman. The full letter can be seen at the end of the first update to this post. I was going to attend John Biggs’s mayor campaign fundraiser at Canary Wharf last Tuesday, but I couldn’t afford the £100 a head ticket price. Apparently hundreds of others could. There seems to have been a pretty impressive turnout by the Labour party, including several leading MPs. Sadiq Khan, who wants to be London Mayor, was there, as was Margaret Hodge, Rushanara Ali, Jim Fitzpatrick, David Lammy, who also wants to be London Mayor, John Spellar and Stephen Timms. John made reference to this issue in his speech at the dinner, a speech I’m told that went down well. Lutfur is so full of crap when it comes to his One Tower Hamlets mantra that it’s easy to be cynical of other politicians when they talk about cross-community unity. But having seen John at work fairly closely over the past few years, I’m fairly sure he’s sincere about it. Thank you for coming this evening. It is humbling to see so many people here. I know you’ve mainly come to see me. But it’s also a sign of the drive our Party has to win back Tower Hamlets. I’m proud to be leading that fight – not for me, but for the change we all know this community desperately needs. We need to start a new chapter in the life of Tower Hamlets – one of the most vibrant and exciting places on the planet. This is my home. I’ve seen it ebb and flow over the years, walking with giants in its proudest moments – falling well short of its potential at its lowest. Today, Tower Hamlets is at a crossroads. Although there is great success and achievement, for too many this isn’t happening. The people are being neglected, divided and, unless they are favoured, left behind by the very Mayor who is meant to help them. Tower Hamlets is a story of ambition and change going back to the roots of the East End. It’s a story of people travelling here, whether from half way round the world or, like parts of my family, the English countryside because they want to improve their lives and the lives of their families. It’s a story of traditional communities flying the flag for and constantly, subtly, redefining our heritage, culture and values. It’s a story of new professionals, entrepreneurs, even bankers. All want to call our borough home. The story of Tower Hamlets is about seizing opportunity, working together and realising potential. Look at what is on our doorstep – the City, Canary Wharf, Tech City, the media and legal centre of the world, world beating medicine, the list is endless – our community should be using those opportunities. Many are. But for many this is not happening. A vital job for a modern council is to make people more powerful. We can do that. Whether it’s SMEs or global giants, I know how much good business can do for the borough. Take where we sit tonight, Canary Wharf. This isn’t an island shut off from the rest of the borough. It’s part of our borough, our community. When I win I want to work with business, not for token gestures or pet projects but developing proper partnerships that benefit everyone. The best way to get jobs for local people is to work with business but Lutfur Rahman refuses unless it involves a photo-opportunity, and he doesn’t care about the detail. 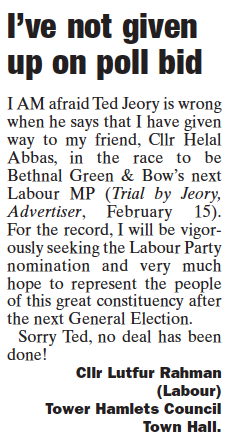 Instead of making the most of the opportunities in Tower Hamlets he fails at every chance he has. Take the Olympics – the golden example. We were at the centre of the world’s biggest festival. 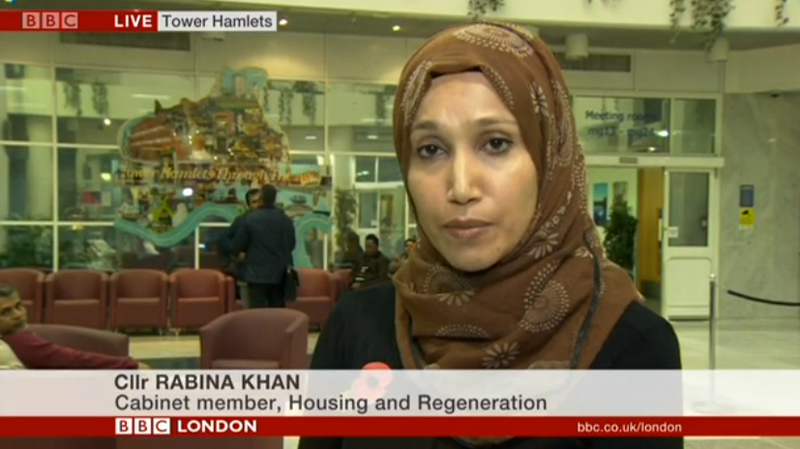 Yet what did Tower Hamlets get? Not a single Olympic event. No marathon. No lasting jobs. No homes. No vision. But maybe that’s not fair – let’s not forget one achievement – the current mayor did get a VIP pass and tickets to the best events. The world on our doorstep just waiting to be invited in and Lutfur Rahman still fails. To tweak a phrase I heard at the Labour Party Conference, Tower Hamlets can do better than this! The problem is he believes it’s not his fault. Always someone else’s problem, always someone else’s fault. It’s wicked business, the evil Government, the McCarthyite Labour Party. The best excuse came recently when his Cabinet suggested that families shouldn’t complain about the late night raves he packs into Victoria Park because it was their fault for choosing to live there. He just doesn’t get it! He says people in Tower Hamlets are victims. We’re not, we’re passionate fighters. I know we can win next year. But let’s not kid ourselves – the challenge facing us is significant. I and my great team of councillors and soon to be announced candidates will be working every second we have to win back control in 2014 but we do need your help. Running elections on this scale is not cheap. And our opposition is mysteriously well financed. We on the other hand rely on you, our friends and members. Tonight’s proceeds will go towards vital materials and another new organiser to help us get our message out there, to show people they have a chance to get the borough moving forward again, not missing every chance we get for another 4 years. Tonight I have a new pledge – I’m told you need one. It’s about stopping that cult of personality that’s more at home in North Korea than East London. No Mayoral mug shots plastered across the borough. No more abuse of East End Life. No more luxury mayoral Mercedes. No more wasting hundreds of thousands of pounds on mayoral ‘advisors’. And sadly no more driver to do the all important mayoral laundry. Joking aside, this is an important point and an important election. It’s about the future of our borough and our people. Whether kids go to good schools. Whether homes are affordable and the streets safe. A community with confidence and a sense of its place. As Mayor I’ll work to make smart choices informed by the Labour values of fairness, equality and social justice. That’s why it’s so important to elect a Labour Mayor here in Tower Hamlets. This is no time to waste money – it’s a time to take important decisions that will help hard working people. That’s why I’ve already pledged to scrap zero hour contracts in the borough and why Tower Hamlets Labour campaigning has forced the Council to blacklist the blacklisters, not working with companies who blacklist workers. Tower Hamlets is the home of Cable Street and not one but two labour party leaders. It’s a melting pot and an economic powerhouse. The richest and poorest of places. It deserves better. The future story of Tower Hamlets is about seizing opportunity, working together and realising potential. The Future story of Tower Hamlets is about One East End – working together to build a better future. A bit different in tone to Lutfur, wouldn’t you agree? 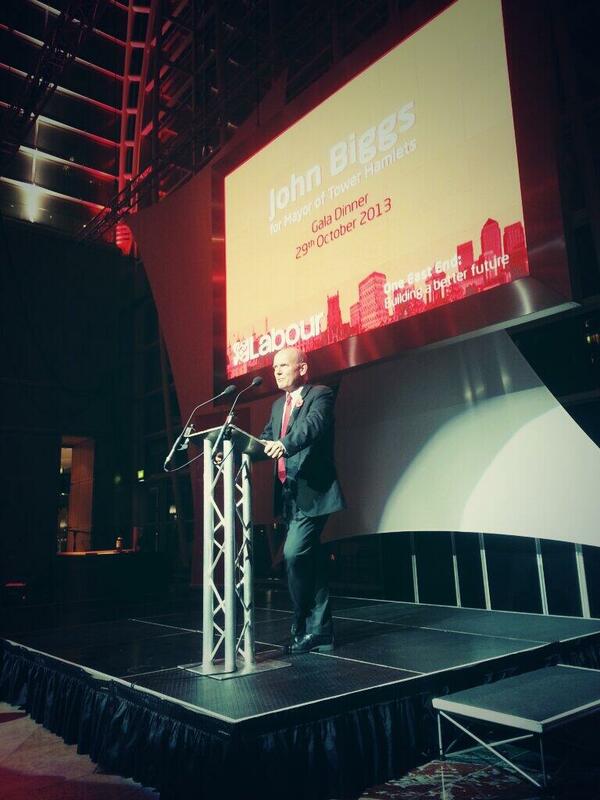 I am writing to express concern about a line in the blog post dated Sunday 3rd November entitled: John Biggs’s speech at Labour gala dinner fundraiser. On reading the second phrase of the above a reader of your blog could easily conclude that funds from the Council’s Voluntary Sector Grants programme were being used to directly fund a campaign. This would of course be illegal and is not possible as council spending is subject to numerous statutory rules and processes plus the check and balance of audit and inspection. Given this, could I ask that you remove this phrase so as to avoid any potential damage to Mayor Rahman’s reputation. It is quite possible that this phrase is libellous. Please let me know your intended course of action. I’ve let him know that it’s pretty clear I don’t mean there’s been a direct bank transfer from the council’s budget to his campaign account (if I had evidence of that, I think I’d have headlined this post slightly differently…). I’m also fairly sure that this blog has made clear over the years that I think Lutfur is exploiting the grants system to buy votes for his political ends. It’s lucky that most of my readers have the ability to understand the figurative meaning of words and phrases; most readers are intelligent to spot the subtle differences. The last person to threaten to sue me in similar circumstances was deputy mayor Ohid Ahmed. SECOND UPDATE – November 8, 2013. Please see the following links containing a letter from Mark Norman, the interim monitoring officer for Tower Hamlets council’s chief executive’s department.